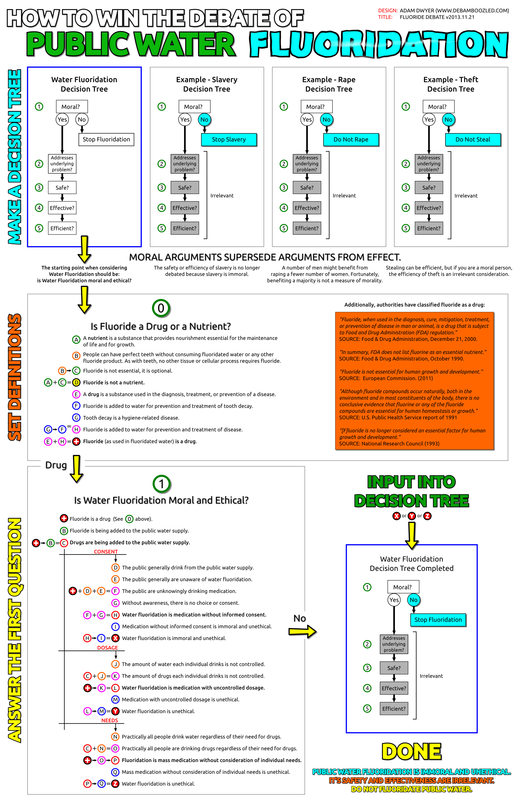 – The decision of public water fluoridation, dissected into its most basic components. – Includes a lesson on the priority of moral considerations. – Sized for 11″x17″ printing. – Free to download, print and use as you wish. Please credit source. When the topic of Water Fluoridation came up in a local Sceptics Society’s Facebook page, I decided to share my experience and conclusions. A week long, 300+ comment, Orwellian nightmare of a debate ensued. … and the “How to Win the Debate of Public Water Fluoridation” poster was born. First, establish that moral arguments supersede arguments from effect. Second, show that fluoride (as used in water fluoridation) is a drug. Follow the inevitable logic: fluoride is being added to the public water… drugs are being added to the public water… people are drinking the public water… people are drinking drugs. —————————3 – mass medication without consideration of individual needs. Public Water Fluoridation is immoral and unethical. It’s safety and effectiveness are irrelevant. Do not fluoridate public water.